This is a an interesting twist to our regular raitas. Usually the ingredients we put in it are not cooked but when I tried this version of raita, I was impressed. This side dish goes very well with any pulav or biryani. We had this along with Mushroom Pulav. The garlic in it gives a very nice flavor to the raita. In a small pan, add oil, saute the garlic and tomatoes along with salt. Keep aside. 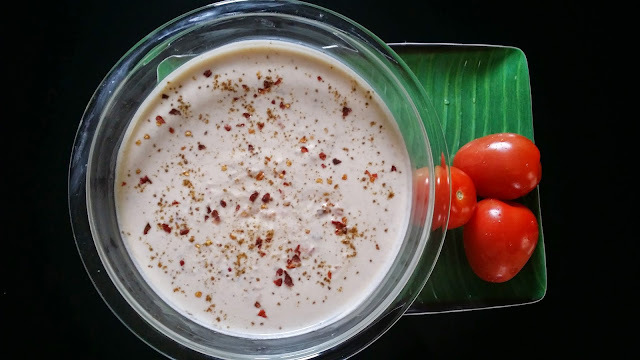 In a serving bowl, whisk the curd, add dhania jeera powder, tomato mixture and chilly flakes. Mix well. Now sprinkle cilantro on top and serve chilled.